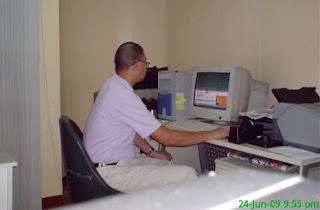 Hubby has been wearing eyeglasses for 24 years now. And it’s one of his best assets that I fall for him lol. Seriously, he can’t stand a day without his eyeglasses on. There was a time, his old spectacles broke and he had to look for the nearest optical shop in our place to get it fixed otherwise he will be forced to go to work with blurred vision. He can’t function well or perform his job better without the guide of his eyeglasses. Although his position doesn’t require him to face the computer all the time as he supervises his people’s output. He can’t help but be tied in front of the computer to make sure his team oversee the quality (color, layout, etc.) of the next day’s issue of the newspaper. Hubby does not like making orders (although that’s part of his job as the manager). He is more of a doer. He doesn’t wait for errors to be noticed. If there are things that needs to be done right away, he do it without waiting for his superior to tell him so. This is the reason why he gets a lot of commendation from his bosses and even his men. Now going back to his eyeglasses, he needs it most especially at night. I worry about him because he usually leaves work late at night and without his eyeglasses he would have difficulty flagging down a bus or FX on his way home. Now you know why I say eyeglasses is the thing that he can’t live without. This entry was posted in Uncategorized and tagged eyeglasses, importance of eyeglasses, public transport on May 2, 2010 by Yami. Even my hubby wears his glasses all the time. I sometimes wish he'd get contact lenses, though, because he has such beautiful eyes and the glasses hide them.